Here’s a little bobber Inception for you. 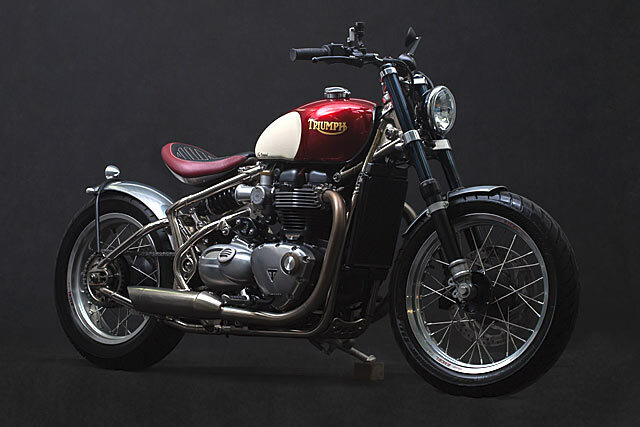 By definition, a ‘bobber’ is a factory bike that’s been stripped down to decrease weight and improve performance. 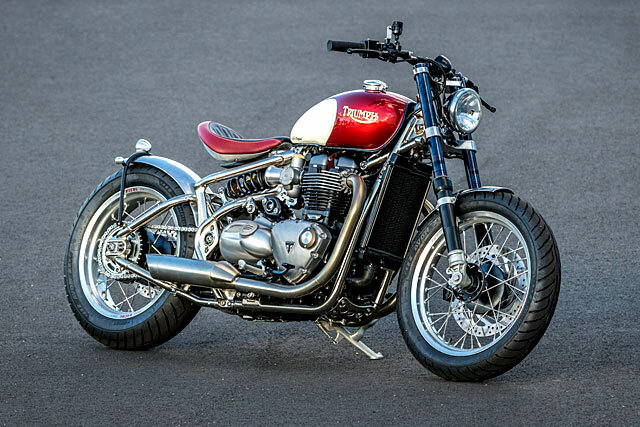 So this begs the question, if a factory builds a bobber, can you still ‘bob’ it? It seems that France’s FCR Original have gone a few levels deeper to provide us with an answer, and that answer is a resounding ‘oui’. Somewhat of a quite achiever, the FCR shop is based just outside of the city of Poitiers in France’s east. Pumping out an admirable 35 or so custom bikes every year, they clearly have their act together. Founded by Mathieu Ménard and Sébastien Guillemot, they cut their teeth in the engineering field before getting busy with custom bikes. They are supported by colleague Espera Sbarro, who excels in bodywork and composite materials. 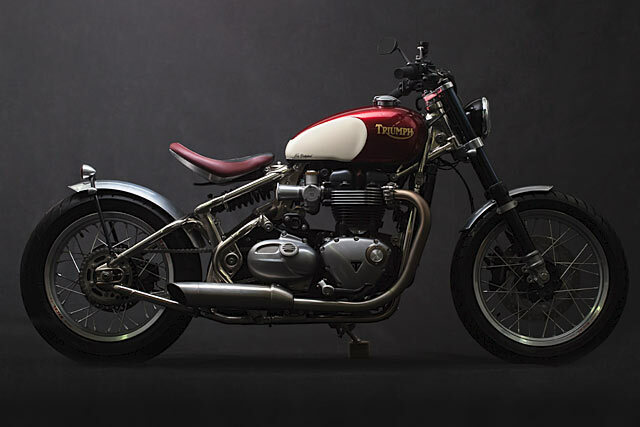 After the success of their ‘Moose’ Triumph Bonneville brat last year, the lads were pondering what they could do with the newly launched Bobber. With enough bikes under their belt to have developed a method to their madness, they considered taking a similar approach with Hinckley’s latest. And that approach is simple; classic looks and clean lines. 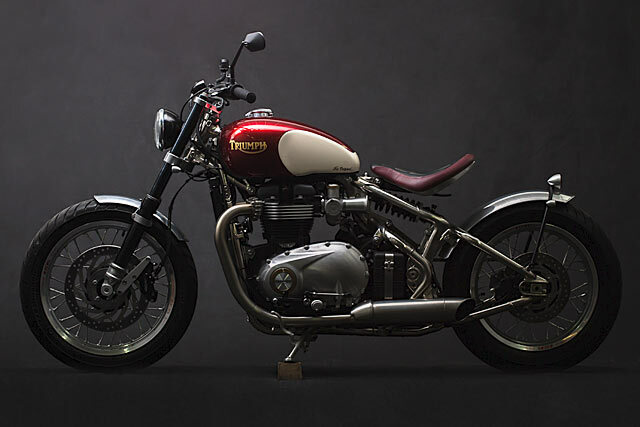 “We chose to keep the spirit of the Triumph brand,” says Seb from the FCR shop. 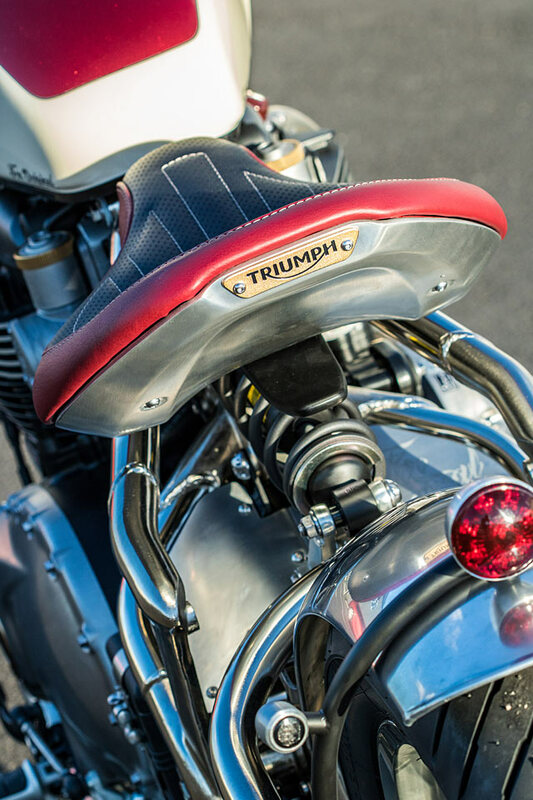 Clearly, there was more than a little research on old Triumph hardtails going on here. 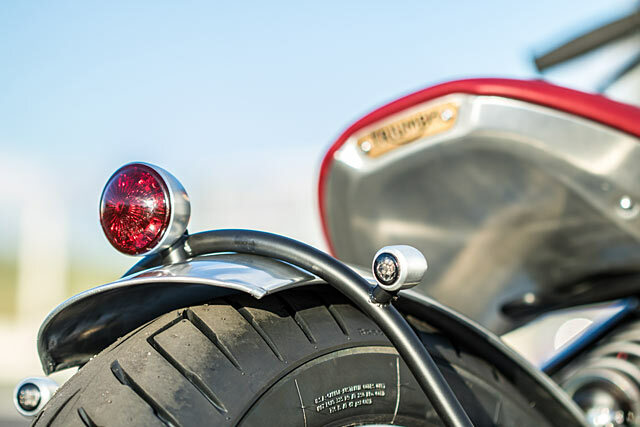 “Once we had it designed in our heads, we worked on the complete disassembly of the bike. 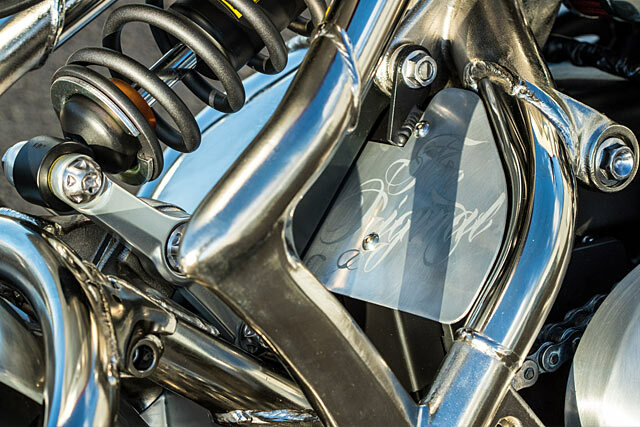 Then the frame and the bike’s rear cage was polished and nickel plated”. And doesn’t it look trick? Next, the bike’s forks were treated to a quick trip to Sweden thanks to build partner Ohlins France. Handed the key to the Ohlins’ storeroom, they eventually went with a Black Edition unit of the right-side-up variety. These were then bolted into bespoke FCR triples that were also adorned with an LSL handlebar, itself having all the required accoutrements to operate the new Beringer front brake calliper. “For the wheels, we mounted 18″ Excel rims topped with Avon Roadriders. With the bike sprung and shod, we began to think about the seat. We eventually chose a two-tone vintage reupholster with a red and black colour theme”. Aquaphobics will be glad to see the team opted for some fenders, even if they are a little on the bobbed side. Part of an overall accessories design, the shop made them from scratch and followed this up with brackets to hold them and some turn signals to boot. Buttons for the signals along with a speedo were supplied by Germany’s Motogadget and then wired up along with the rest of the bike. Finally, the engine was fitted with new JV velocity stacks on the in side and some FCR-shortened Triumph cans on the out. 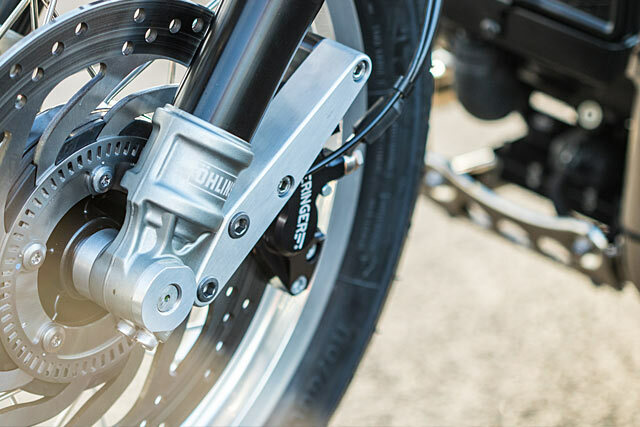 “We have removed the factory’s plastic side covers and added a polished aluminium plate with the shop’s name beneath the rear shock”. 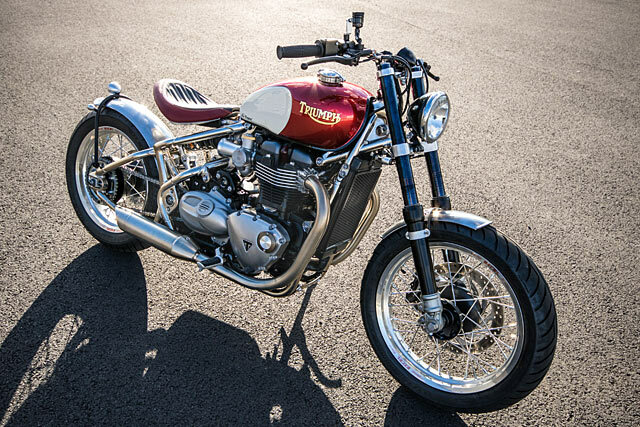 The last word was had by the FCR spray gun, covering all the best bits with a candy apple red and topping it off with some gold leaf Triumph lettering. 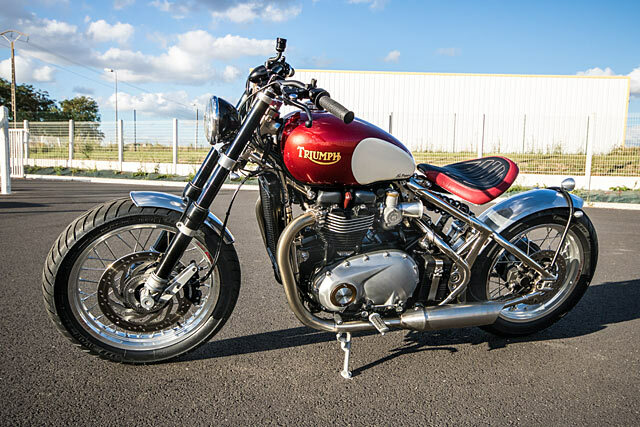 In an all too familiar tune, Seb bemoans the time and effort they had to spend trying to get the Triumph’s electrics to play nice. “It was the most complex part of the build by far,” he exclaims. Battling through the bike’s multiple layers of wires and software obviously paid dividends in the long run, because now the bike runs and rides like a dream. STRATOSPHERIC. A Rally-Inspired Ducati Monster From Vida Bandida.